It’s the spookiest time of year, and these are the Halloween baby names that celebrate the season. Seasonal names work for lots of reasons: they create an automatic shortlist, celebrate a favorite time of year, or just plain express your personal style. Halloween – and fall in general – happens to be my favorite time of the year. While I think names like Autumn are far more mainstream, some amazing choices lean a little bit darker. But that doesn’t make them any less wearable – at least some of them. Trying to decide if a name is too much? It’s not exactly the same question, but Can I Use This Bad Guy Name for My Baby? might help. 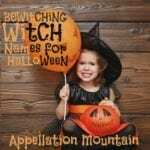 This list of lists rounds up the best of the Halloween baby names lists you might find anywhere online – including Appellation Mountain. Bewitching Witch Names, from Antha to Willow and everything in between. A long list of Vampire Names, courtesy of The Beauty of Names. Nothing Like a Name has all of the Disney villain names. Ghosts with good names, at Nameberry. Names from The Vampire Diaries. Days of May has Buffy on her list. One of my favorite television heroes, ever, so I can’t resist adding her list to mine. 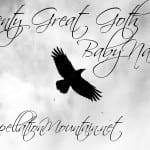 Love this eclectic list from Baby Name Wizard: Belladonna, Graven, and Morrigan, oh my! Twenty Great Goth Baby Names. I love Tanith and Rook. A list of edgy boy names inspired by the season. Though I really don’t know if I could name my son Igor. Surprisingly spooky names given to actual children in the US, at Baby Name Wizard. … but that reminds me, I have a list of Night Owl Names for Girls. Nothing Like a Name browses pagan-inspired baby names. Samara, Damien, and a few more creepy names from horror movies. I love the name Bram for lots of reasons, but Dracula author Bram Stoker puts it on this list. Edgar Allan Poe put Annabel on this list, but it’s the creepy doll from the 2014 movie that modern parents think of first. 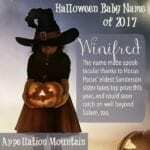 Winifred won the first ever Great Halloween Baby Names Contest in 2017. I don’t think it screams Halloween, but it is the name of Winifred Sanderson, of Hocus Pocus fame. 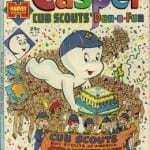 Casper comes up all the time, and I think it could wear well – except is the ghost reference a deal-breaker? Monster High Names, because Cleo and Twyla are too good to keep for just the dolls. Thirteen – of course! – baby names inspired by Hocus Pocus. Mythical creatures, like Phoenix and Faun. These nine names aren’t specific to Halloween – but they sure can inspire some great Halloween costumes! Heath, Charleston, and more candy-inspired options. The Disney villains! Don’t name your baby Maleficent, but I still think Ursula should be reclaimed. Hoping this link works here – Ren ran a great name game on Insta. Wednesday Mirabelle and Casper Orion are my favorite combinations. Thanks to Alexia for sharing it! 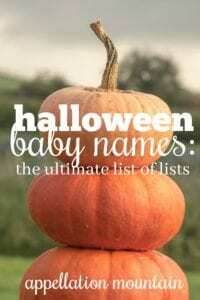 What are your favorite Halloween baby names? Would you consider any of the names from this list of lists?